Similar yet quite different from the other temples, Puru Lempuyang Luhur is one of the highly regarded temples in the city. The reason of which can be deemed to the fact that it is the oldest of all. 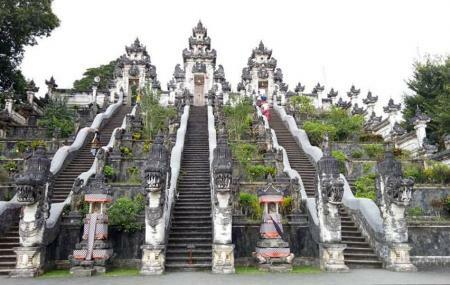 The temple lies about 1175 m above the sea level on the peak of Mount Lempuyang in the region of East Bali. To reach the temple, one needs to climb a series of steps (more than 1700) that passes through many attractions. There are quite a number of temples along with numerous macaques for visitors to check out. The blend of culture and adventure makes this place ideal for adventurers and introverts alike who find the duality of nature and spirituality quite attractive. A must visit in Bali for sure! Pura Lempuyang Luhur is not one of the most important things to do in Bali like Tanah Lot Temple, Tirta Empul, Mount Agung, Mount Batur and Bali Bird Park. Bali is replete with experiences which can be enjoyed with any of the Bali tours! To personalise your visit to the city, you can use an all-inclusive Bali trip planner for the same that will give detailed information about visiting the city. You can enjoy a comfortable stay in the city by booking the best hotels in Bali like Gatra Ubud Inn, The Peacock Inn, Kampoeng Joglo Abangan and Bije Sari Suite Bisma. Chalk out the best way to discover the city with Bali vacation packages. Check out various modes for how to reach Bali. How popular is Pura Lempuyang Luhur? People normally club together Pura Lempuyang and Jemeluk Beach while planning their visit to Pura Lempuyang Luhur. The temple complex exist of 7 temples, for which you need approx 4 hours to visit. We only arrived later in the afternoon, so we could only do the first temple, which is also the most famous temple. At the entrance you pay 10000rupiah per person for the sarong and you can make a donation as well. No other entrance fee is required. At the first temple you can take a picture at the gates of heaven. Someone will take a picture for you. We waited for almost 2 hours in line. We were doubtful if it was worth it. But in the end we got some amazing pictures. The photographer uses a special mirror to reflect part of the image.. The photo may not be really authentic, but it looks really cool. We only found out that he was taking pictures with a mirror after we saw the pictures. If I would have known before, I would ask the photographer also to take some "natural" pictures. After the pictures you can make a donation. We paid 20000 for 2 people. It seemed that most people were paying 10000 per person. Amazing group of 4 temples - you need approximately 4 hours walk/hike to see all. The first and most popular is 5 minutes walk from the entrance. The other ones are up the mountain. Entrance fee is a donation and they lend you a sarong to be allowed to enter the temples. Very friendly people. For the famous photo-shot you have wait at least one hour. One if the staff is taking the pictures with your mobile phone or camera - trust him he is doing a great job and does not ask for money, anyhow he will be happy to get a tip. Beautiful place! U have to rent a sarong if u are wearing a short dress or if you are shoulders are uncovered. They will ask u for some donation and 10000 idr for one sarong for adults. Also there was a lady who was wearing a full length dress with jacket on the top, still they insisted her on buying the sarong. There was big queue for want getting picture at the gate. This place is so special but packed with pushy tourists! We climbed to the top of the stairs to get away from the crowds and got to sit and talk to "the keeper of the gate". He was sitting, making sure that only those who were dressed for ceremony and prayer entered in to the temple. Being up there, with him and with the majestic view of Mt. Agung was very special for us. Go very early if you want to take your own pictures at the gate and if you want to avoid a line that can take several hours to get through.